I recently added a fundraising widget to the homepage of this site. I don’t really expect anything much to come out of it, but I’m not above begging for donations! I really need a new bike to run the dogs with. The bike I currently use is falling apart. The brakes only work thanks to some extensive duct taping. The gears don’t switch right. The chains are falling off. Honestly, it was never a great bike to begin with. It served me well for what it was worth, but now I need to move on to better things. I did buy a new bike. Right before the Fair Hill Challenge, I bought a brand new and better version of my old bike. Big mistake. For those who don’t recall, the bike fell apart during the race. 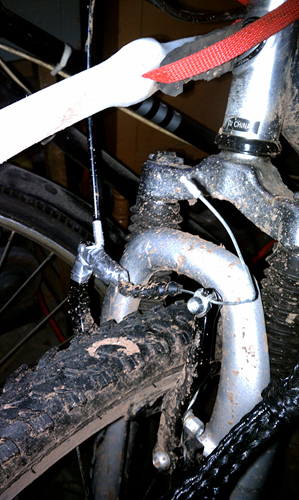 The chain fell off and the brakes came loose – all problems my current bike suffers from. All problems that I thought were due to lack of tune-ups and general maintenance. Nope, apparently they are just crappy bikes. Thankfully, I was able to get my money back on the crap bike. But that left me with my old, equally crappy bike to work with. So I duct taped it up and have been using it ever since. Does it have the control and stability I really want and need? No. Can the dogs pull me on it? Yes. I’ve come to terms with the fact that I’ll need to spend more than $200 or $300 to get a decent bike. I’ve heard great things about Trek bikes. 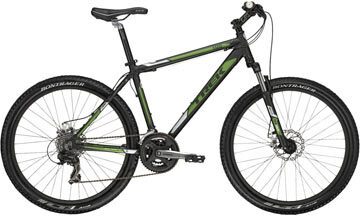 Of course, the model I narrowed my search down to costs over $450 (Trek 3500 Disc Bike). It’s hard for me to justify spending that much money, especially when I do have a rig I could use. I don’t necessarily need a bike at all. The thing is… I truly love biking in general, even without the dogs. It’s always been one of my favorite activities. I’m not especially good at it. It’s not something I’ve ever been competitive in. Hell, I’ve never even been on a “street” bike. My love is partly for nostalgic reasons. Rolling along on a bike on a warm summer evening brings me to a happy place. You can only imagine my excitement after discovering bikejor – a sport that combined my love of biking with my love of dogs. Rolling quickly through the Pine Barrens, behind two crazy dogs, doesn’t stir up the same feeling as my nostalgic summer rides, but it brings me to another equally happy place. If anyone decides to throw some bucks towards my bike fund, I’ll be eternally grateful. This year, I’m trying to cut back on spending. After all the mushing-related expenses last year (well over $1000, not counting the truck I bought to make everything possible), I will have to wait on the new bike. I’m going to sell some stuff, as well as take on some freelance work, in hopes of making some extra bucks. My goal is to set aside $500, not from my paychecks, by this fall. If I can buy a new bike without using my normal pay, I will have succeeded!